The world we know is changing. The western world dives into a new era. Boundaries are broken. New frontiers are reached. The war on terror, chaos, and tyranny has set foot onto new grounds. The fight is carried to our doorstep. Recent terror threats have pressed American authorities to increase the securitywarning to high alert. In the heart of downtown, Marines are called upon tosafeguard the citizens. Summer festivities and business conventions are underwayand some streets have been closed off for the activities. On this hot summer evening, an innumerable group of terrorists, assembled from allaround the continent, have put to execution a never before seen large scale attack. 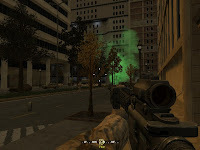 Taken by surprise, your mission is to eliminate all terrorists and rescue pinned down colleagues and civilians throughout the downtown streets. There isn't a lot of thing to tell about design...it's sure repetitive and not that much detailed in general but this is what lots of city town looks like. Gameplay is one more time the highlight of this pack by mixing in a quite professional way, short cutsceenes, voice acting and triggered events. Babycop pushed this COD4 experience to a level not enough reached before. The scripting approach as a kind of dancing lesson were the teacher lurn you to move with a certain rythm so that you totally manage to enjoy the experience that you just learn. Babycop's experience alternates heavy challenging fights, enjoyable cutscenes, and even some sniping precision objective. It's put together as a road movies and immerse you into the mission as the leading actor...you don't really pay attention to design and detail you simple rush for a tremendus experience with you squad. 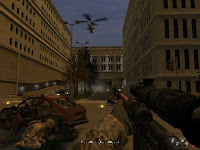 In conclusion: After a first opus in the homefront serie that disapoints me a little, Babycop took the necessary time to shine with a release that cetainly gonna sound in the future as a MUST PLAY experience... Irak war is certainly not far way from this experience, hopefully it's just a game for us.